Maior autem his est caritas: Mother Teresa wasn't really Catholic? As Catholics the world over (and no doubt countless others) rejoiced at the canonization of St. Teresa of Kolkata this past Sunday, it was expected that the criticisms and attacks of her from the secular left would appear on the internet and in mainstream media. Yesterday, on my FB page, I shared an excellent rejoinder, written by a non-Catholic Christian: "The Most Evil Woman Who Ever Lived." (yeah, it's a click-bait like title, but well worth the read!). What I was less prepared for was attacks on Mother Teresa from Catholics. To be more precise, from certain elements of the Catholic right. I first saw this on a FB post by a friend (the author of a popular blog about the traditional liturgy), where he was defending Mother Teresa, as various commenters attacked her fidelity to the Gospel, to the Great Commission, or questioned the infallibility of canonization decrees. On my own FB post (mentioned above), a commenter shared some links she'd come across of Catholics accusing Mother Teresa of, well, not being Catholic enough. All right, but even if this is the case, and even if it’s possible to find salvation without being a baptized member of the Catholic Church, why wouldn’t Mother Teresa try harder to bring people out of the “shadows and images” of other religions that only hold some small portion of the truth? Why didn’t she try harder to get that Hindu or that Buddhist to acknowledge that Jesus is Lord? A better question: How could anyone try any harder than she did? I suspect for many Catholics, especially those in the West, and perhaps especially those on the traditionalist/right end of the spectrum, the question of conversion of non-Christians is a purely abstract and theoretical one. Conversations tend to be about someone else -- why don't they (the Church, those missionary orders, priests, Bishops, religious, Mother Teresa) do more? Clearly it must be that they don't believe in the Great Commission! Clearly it must be that they're part of the Great Apostasy! Clearly it must be that they have abandoned the True Faith! And so on. In India, of course, Catholics are a small minority, who have, for the most part been tolerated, and peacefully co-existed for millennia in an entirely non-Christian context. I'm a convert, who was attracted to the Church initially through her (much neglected!) musical heritage, while I was in India. 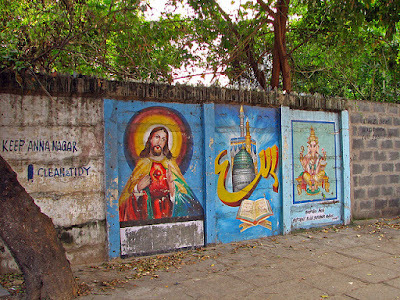 I know of several converts in India who have come to Christ, and though I am often critical of the a lack of missionary zeal (as well as the indifferentism and theological pluralism) that I do see in elements of the clergy and hierarchy in India, there are many places where the Gospel is indeed being embraced. Non-Christians, however, aren't a bloodless, distant, abstract reality for me. My family is entirely Hindu. My father, who died in 2007, did not have any spectacular death-bed conversion. He suffered greatly in the last few weeks of his life. I prayed with him, and sang to him (his favorite Christian hymn) as he died. I pray for him every day, at every Mass that I offer. My dear mother and I have had many a philosophical conversation, especially since my father's death. The Christian claim of the exclusivity of Christ, the only Way, is simply unfathomable to the Hindu mind. Conversion is often seen as spiritual violence (Mahatma Gandhi was an opponent). My brother, my extended family, all largely supportive of my own path (a gaggle of family turned up to celebrate at my Ordination to the Priesthood), seem quite impervious to "conversion." Impersonal conversations about the "fate" of non-Christians are rather personal for me. Translated into the language of the present day, this statement might sound something like this: agnostics, who are constantly exercised by the question of God, those who long for a pure heart but suffer on account of their sin, are closer to the Kingdom of God than believers whose life of faith is “routine” and who regard the Church merely as an institution, without letting it touch their hearts, or letting the faith touch their hearts. The human heart is a deep mystery. The only deeper mystery is the Author of the human heart, who, also assumed a human heart Himself! I recall a conversation a few years ago, with a young Carmelite nun in Gujarat, herself a convert from Hinduism. "Father, you must believe that the Lord loves your family and desires their salvation more than you do! Trust in His will!" I will never forget the deep wisdom, and the simple trust that she showed, and shared with me as a gift. Recently I was back in India, on a temporary leave of absence, looking after my mother who was then quite ill. Over my time there, I had the opportunity to offer Holy Mass for the Missionaries of Charity. Three times a week, at 6:30 am, in a small, hot, stuffy chapel, with fans that were largely ineffective against the summer heat. The MCs run a house for orphaned children, girls and boys, as well as mentally challenged adults, and several others. Some 150 folks in all, cared for by 12 sisters and several volunteers. The front row at Mass was always filled with a line of little girls, seated cross-legged, bright ribbons in their tidy pigtails, and even brighter smiles. Mass was in Hindi. I preached, as best as I could, in Hindi. I didn't know any of the songs, but everyone sang with gusto. After Mass, all the children would come up and shake my hand. "Thank you Father!" One young fellow, with Downs, always came up for an extra hug. The Sisters served a delicious hot breakfast, and one of them always sat with me as I ate, while the others busied themselves with the various tasks of the day. One day, Mother Superior told me that the previous week, three of their residents had been baptized and received into the Church. What joy! But many others didn't. On one of my rounds, a slightly mentally disturbed man saw me coming and yelled out, "Mein Allah ka malik hoon!" (I am Allah's Master!) The Sister with me chuckled. I smiled. One day, my 85 year old mother accompanied me across town to the MC compound, braving the afternoon heat. The Sisters received her with great affection, and we got a tour of all their facilities and spent some time with the younger orphans. Later that day, I noticed her sitting very quietly, lost in thought, in her armchair. "What're you thinking?" "Those Sisters, this is their whole life! They work so hard, all the time! Yet, they seem so happy!" Indeed, they are happy! Not without struggles and doubts, but they've found the greatest thing in the world, Love, and they live their lives for Love. If we could only see this, how could we ever cast such categorical judgments on the amazing life of Mother? If we can't see this, then it's because we've been blinded by abstractions and ideologies, to the reality, continually being presented to us by God, in front of us. None of this is to promote indifferentism, or theological pluralism, or an abandonment of the Great Commission. It does, however, behoove us to recall the gift of human freedom, and the need to always live intentionally, ourselves, and to always let the different humanity, the renewed and still-being-renewed-new humanity that Christ brings, be a provocation, and an attraction, for the deep desires of the heart of others. It always means looking at the other with the gaze of love of Christ, and to desire their deepest most enduring good, and certainly of the invitation that the Lord always makes, "Come and see!" The Holy Spirit is the author of all conversion in every human heart. Not Mother Teresa, not I, not those who share their smug judgments on various corners of the Internet. Though I do know that the kind of self-righteous indignation I have seen from certain Catholics towards Mother Teresa will never, actually, attract any of my family to the Church.